This spring we are super excited to be having trunk shows by two of our most loved designers: Martina Liana & Essense of Australia. What is a trunk show you ask? Well, during the Trunk Show event, which is held over a Saturday and Sunday, we will exclusively be given the newest wedding gowns from a designer to showcase to our brides-to-be. At select events, the designer and/or a representative will attend, giving the bride an opportunity to talk with them about the inspiration, trends and details behind the designs. A trunk show can be a fantastic opportunity to see, try and buy next seasons wedding gowns before anyone else! Here at Georgina Scott Bridal we regularly host glamorous trunk shows for the best wedding dress designers in the industry and this spring we have the following trunk show events booked in just for you! At Georgina Scott Bridal, Martina Liana is always one of our most popular trunk show designers. Revealing their latest collection, we will be showcasing their best pieces for brides-to-be to view. Martina Liana is the couture label from the Essense of Australia house and is the go-to-designer for a bride who wants to radiate confidence, glamour and style. Every cut, every embellishment, every consideration of a Martina Liana design is made with one idea in mind. When you select a Martina Liana creation, you wear something far more than just a wedding dress; you make a statement. Essense of Australia are known for their sensational collection of wedding gowns that appeal to every bride, regardless of size or style—Essense of Australia offers everything from classic floral lace dresses and vintage-inspired trains, to sleek and simple gown silhouettes for the chic, modern bride. Their dresses are inspired by the ethereal beauty and romantic spirit found in Australia’s natural wilderness. Combining elegant fabrics with intricate beading, these wedding gowns are designed for fashionable brides who appreciate the romance and tradition of classic bridal styles. What’s so special about Essense of Australia is their EveryBody/EveryBride range. This is a large selection of wedding gowns from their collection which have been adapted to fit the curvier of figures and flatter ladies from size 18 to 36. The superb fit, exquisite finishing and unmatched attention to detail of Essense of Australia wedding dresses ensure an unforgettable wedding-day look for every bride. From modern sheer cutouts and vintage styles with lace-adorned trains, to simpler, more streamlined silhouettes—Essense of Australia creates timeless, romantic wedding dresses that will be adored for years to come. You can also contact us via our contact from found here: Contact us! 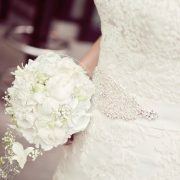 One of the biggest processes during wedding planning is finding the perfect dress for the bride to be. Choosing your wedding outfit can be difficult, as you will want the perfect dress to flatter your figure, suit your style and show your personality in all the right ways.o, when you, as a bride, feel under pressure when you can’t find your dream dress and the clock is ticking it can feel like the entire wedding is falling apart. However, trunk shows provide bidding brides with the opportunity to explore the latest collections from designers to spoil you for choice. Attending a trunk show can also be a fun experience, as you will be surrounded by wedding dress experts and you can invite family and bridesmaids along too. Here at Georgina Scott Bridal we regularly host glamorous trunk shows for some of the best wedding dress designers in the industry. At Georgina Scott Bridal, Essense of Australia is one of our most popular trunk show features. Revealing their latest collection, we will be showcasing their best pieces at our Stourbridge store for brides to be to view. Essense of Australia are well established wedding dress designers, best known for their flattering fits, delicate embellishments and romantic designs. Their ensembles typically consist of full length, flared skirts and sweetheart necklines for a classic and elegant look. If you’re looking for a wedding dress with a more retro vibe, Brighton Belle offer gorgeously feminine, vintage inspired tea length dresses. They incorporate unique features, influenced by the 1950s era, such as satin collars, circular skirts and sheer sleeves. Their circular skirts in particular are the perfect style for when it’s time to get on the dance floor, as they create a beautiful silhouette. Then paired with sophisticated necklines and sheer floral detailing, they create the perfect vintage look for a modern bride. If you’re Wedding planning this Summer and are looking to find your perfect “I do” dress head down to the Georgina Scott Bridal trunk shows this August. Both Essense of Australia and Brighton Belle will be featuring at our Stourbridge store, at The Chapel on Pedmore Road. For more information get in touch with our team on 01384 893656. The best accessory to any wedding gown is confidence. On your special day, allow yourself to feel confident, comfortable and fearless with the dress of your dreams that flatters both your body and your personality. This time of year is the perfect time to begin shopping for your “I do” dress, as designers are releasing their latest collections. And where is better to catch the first glimpse than a glamorous trunk show? 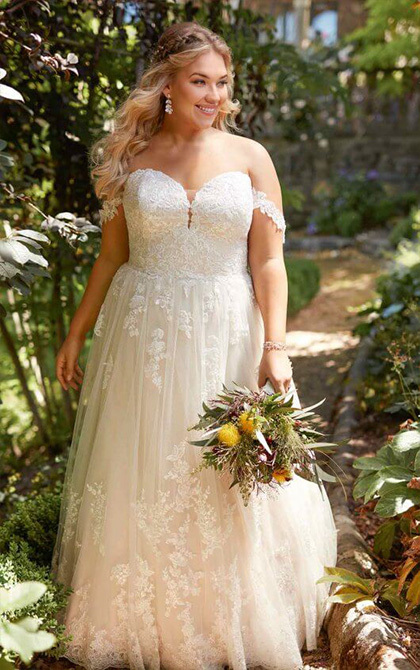 At Georgina Scott Bridal we have added another exciting trunk show to our events list, featuring the collections of Essense of Australia for curvy brides! Essense of Australia are an award-winning wedding gown designer, specialising in elegant and detailed bridal wear. They offer a range of silhouettes, materials and designs, as well as catering for different body shapes and the latest trends, to make every bride feel her most beautiful. Their latest collection caters to brides with curvy figures in a range of beautiful styles. From lace necklines to low back drops and dreamy embellishments; whether you’re looking for something classic, modern or unique they will have it all! A wedding day is one of, if not the most, important days of many people’s lives. For a lot of brides, one of the most exciting aspects of this special day is being able to walk down the aisle in the dream dress. A dress that expresses her personality perfectly and flaunts her figure in a way no other dress can, making her feel her most confident. Finding the right dress really is love at first sight and there’s no better time to shop than now. Wedding season will soon be upon us as designers are beginning to release their latest collections for 2018. So make sure you find “the one” before it’s too late, at our latest showcase. Georgina Scott Bridal are excited to announce the upcoming arrival of Essense of Australia’s trunk show at our Stourbridge store. Local brides-to-be will be given the opportunity to review Essense of Australia’s latest collection and place their orders. Essense of Australia are award winning designers, specialising in signature bridal gowns. Their collections combine sensuous silhouettes with enchanting detailing, completed to the highest of standards, to make every bride feel cherished. 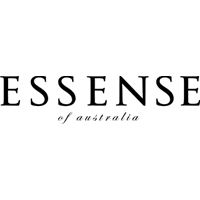 With a range of classic and contemporary designs, Essense of Australia’s latest collection has something for everyone. They offer a selection of stunningly simple designs, as well as beautifully ornate gowns. 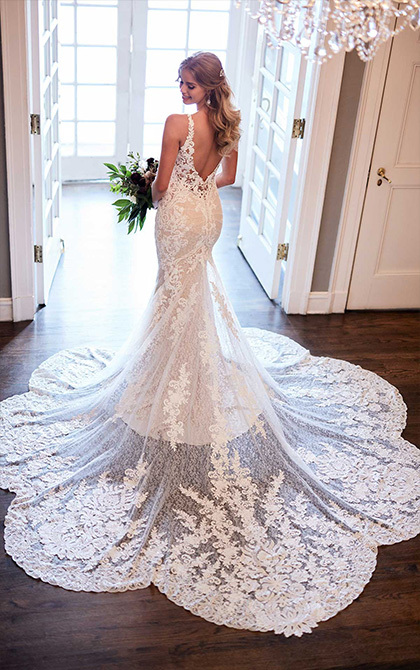 You can discover a variety of romantic styles with delicate lace detailing, teasing backless designs, mermaid tails and more at our upcoming trunk show. If you’re a future bride planning your special day, yet to find the perfect “I do” dress, come along to our trunk show for a day of glitz and glamour. Essense of Australia’s collection will be showcased from 16th-18th March 2018 at our Stourbridge store. We’re giving you the chance to beat the January blues and get ahead with your wedding planning as we host a bridal showcase at Blakelands Country House later this month. It’s a popular event in the Georgina Scott Bridal calendar, as each year we transport virtually the entire contents of our bridal shop to the Blakelands Country House and Restaurant in Staffordshire. It’s the perfect opportunity for Brides to Be to browse and try on gowns from our various designers and have a look around the house – possibly sorting the dress and venue in one go! Our visitors will have the chance to try on and purchase dresses from us at this free to attend event, and with tea and coffee being served and the Blakelands bar open, it is the perfect opportunity to indulge in a little wedding shopping ahead of your 2018 or 2019 big day. To make a personal connection – you will probably be spending the next 6-18 months planning your wedding, so it is important that you like, trust and get on with the people providing your wedding services. By meeting the Georgina Scott Bridal team in person now, you can rest assured that we’ve got the expertise, experience and friendly faces to ensure your dress shopping is a huge success. To find out what is popular – you may have a wedding theme in mind or have seen designers that you like, but until you see the different styles of dresses available and try them on you won’t know what suits you or what will be in keeping with the theme you have planned. Our bridal showcase is the ideal opportunity to view the latest ranges from a wide variety of designers, inspired by everything from vintage to contemporary styles. To get advice – if you are new to wedding planning (which you probably are!) then chances are you won’t have much information in terms of timescales or what to anticipate when choosing a bridal gown. Our showcase event is a good opportunity to ask questions about what happens after your have chosen your dress, so you know what to expect in the run up to your big day. If you can’t attend our Bridal Showcase on the 28th don’t worry as you can call us on 01384 893656 or connect with us on Facebook, to book an appointment at our Stourbridge store. We Take to the Road with your Perfect Wedding Dress this Autumn! October is shaping up to be a busy month for the Georgina Scott Bridal team, as we take a selection of our gorgeous bridal gowns to a number of wedding fayres and events in the region. If you are getting married next year or even in 2019, then an autumn fayre provides the perfect opportunity to find your perfect wedding dress. What to expect: A great opportunity not only to see the gorgeous Blakelands venue decked out in all its marital splendour, but also the chance to meet the Georgina Scott Bridal team and view some of the gowns from our most popular and exquisite collections. 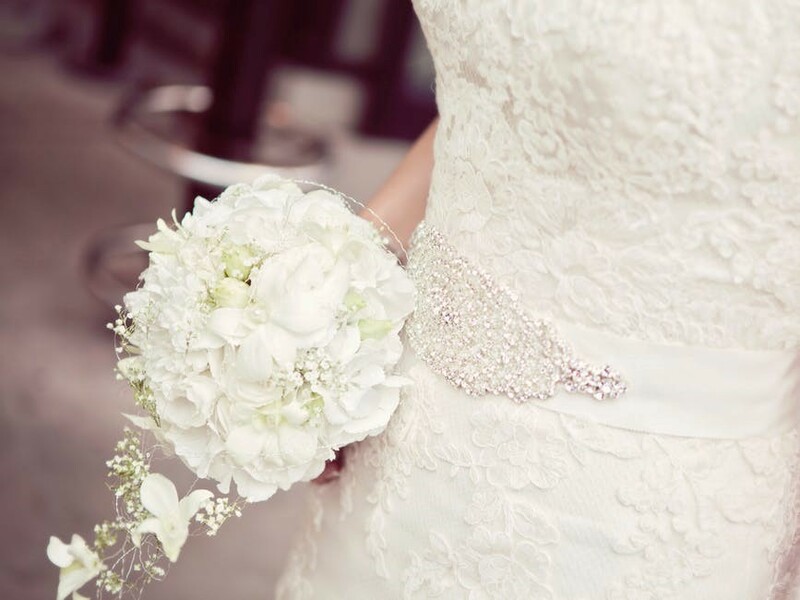 What to expect: Chat with the helpful team at the Holiday Inn about your plans and explore the venue and then join us to look at some of our stunning wedding dresses to see if we can help you find the perfect gown for your big day. Whatever date you have set and whatever style of dress you are dreaming of, it always pays to look at what is available, particularly if you haven’t found ‘the one’ yet. So, if you can’t join us this October at any of the fayres we are attending, why not book an appointment at our bridal boutique in Stourbridge? To make an appointment please give our team a call on 01384 893656 or email us at enquiries@georginascottbridal.co.uk. Don’t miss our Essense of Australia Designer Show, taking place on the weekend of the 28th and 29th October, right here at Georgina Scott Bridal, where we will be previewing the Spring Collection from this popular, romantic bridalwear designer. https://georginascottbridal.co.uk/wp-content/uploads/2018/10/website-logo.jpg 0 0 admin https://georginascottbridal.co.uk/wp-content/uploads/2018/10/website-logo.jpg admin2017-10-12 15:32:302017-10-25 13:00:37We Take to the Road with your Perfect Wedding Dress this Autumn! Georgina Scott Bridal are proud to present our designer feature: Essence of Australia. We are one of the largest stockists in the Midlands region and have access to stunning dresses from their latest collection. Wedding dresses from Essence of Australia come in a range of styles and looks. Essence of Australia dresses combine impeccable fitting with couture finishing, bringing details to life. Their dresses are influenced by fashion centres across Europe and New York and are designed in-house by their own talented and highly experienced designers. With a signature Essence dress you can expect luxury, elegance and magic. The use of lavish fabric, beautiful beading and exquisite craftsmanship is what makes these bridal gowns so unique and perfect. Each season gives Essence a chance to explore fashion in a different light and bring forward stunning bridal dresses as well as integrate a compilation of Swarovski, lace, chiffon, satin, zip and button detailing which, when combined, results in fabulous fashion. Shopping from their collection is a dream for any bride. We’ve listed the types of dresses that would suit each type of bride. Georgina Scott Bridal have a designer weekend coming up on the 15th and 16th April and will be featuring the beautiful dresses from Essence of Australia. If you would like to book a slot, call us on 01384 893656.